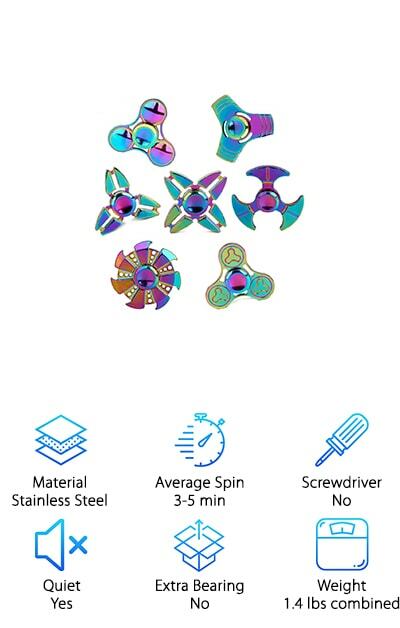 If you’re looking for the best metal fidget spinners, you’ll need to know what sets them apart from the other options on the market. A great way to reduce stress and release excess energy, this awesome toy recently gained popularity and now there are folks “professionally” spinning via cool tricks! Whether you’re looking for something simple to occupy your time or you want to master the art of the fidget spinner, we have something for you. Our experts developed a top ten list to help you shop. Let’s get started! 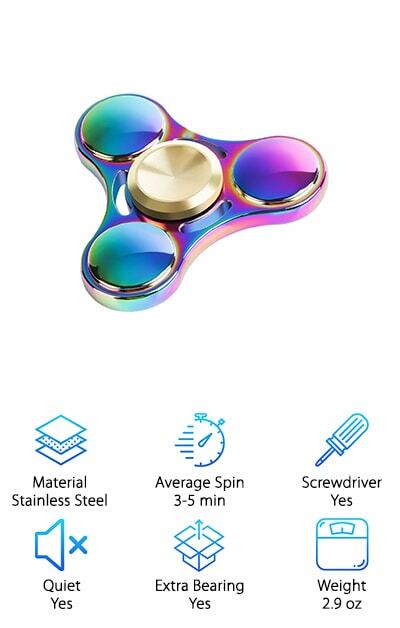 Material: You want your new fidget spinner to be the right look and feel for you. Whether you prefer steel, aluminum, or copper, we have something for you on our list. 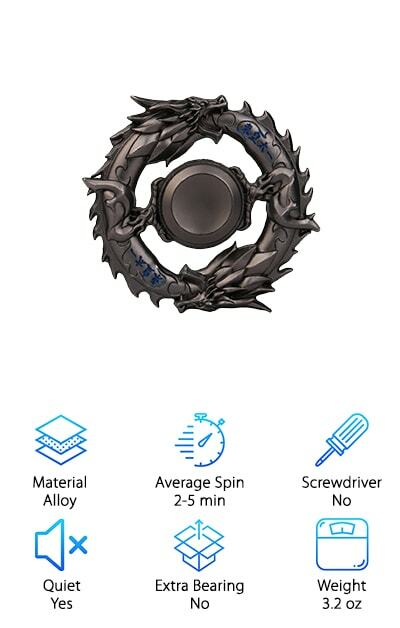 Check this spec to determine what the spinner you like is made from. Average Spin: Some spinners spin faster and longer than others. 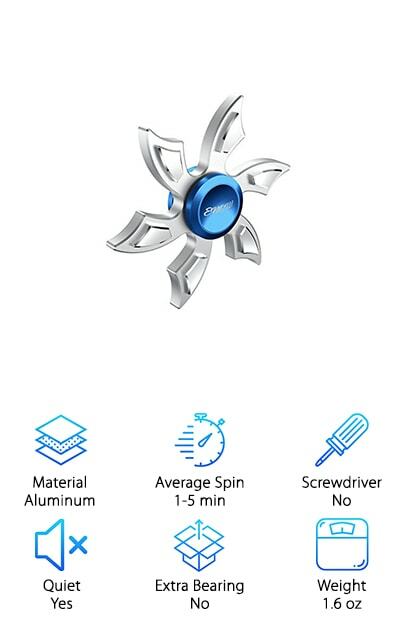 This spec lets you know how many minutes your spinner can go before you need to activate it again, so you can make the right choice according to your specific desires. Screwdriver: You want the perfect, tiny, convenient screwdriver, so you can tighten and loosen the bearings or easily replace parts on your favorite spinner. We’ve got all the info you need on what the model you’re eyeing comes with right here. Quiet: Depending on where you’ll be using your fidget spinner, you want to know if it’s appropriate for the environment. Quiet or not, we’ll tell you the deal with this spec, so you can stay mindful of those around you. Extra Bearing: If the spinner you’re interested in comes with a replacement bearing, you can find the information on this spec. It’s always helpful to have extra parts, especially ones that you’re positive will fit your device. 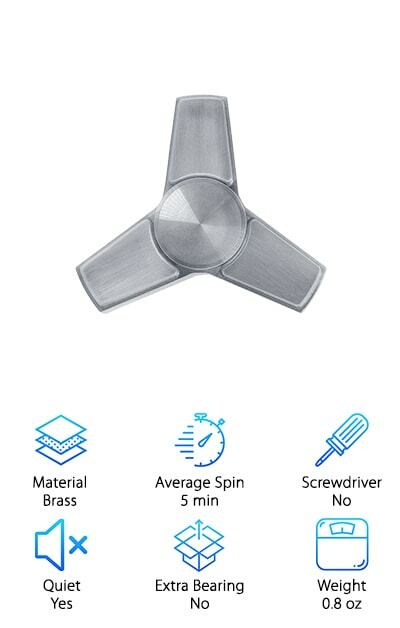 Weight: We want you to be comfortable and to find the spinner capable of performing all the necessary tricks you want to master. Check this spec to find the weight on your spinner of choice, so you can be sure it has everything you need. You know what to look for now, so it’s time to check out our list of the best fidget spinners. We carefully researched and reviewed each one to bring you only the top-rated models. You’ll find enough information about each spinner to make an educated decision, so you can spin in style and comfort. Wherever you are, your spinner goes with you. We want it to meet all your expectations, so we gave you ten awesome choices. Let’s get shopping! Our top pick for the best metal fidget spinner is the TYZEST. This smooth, red copper spinner can go for up to eight minutes of continuous spinning on its own with the right motivation! 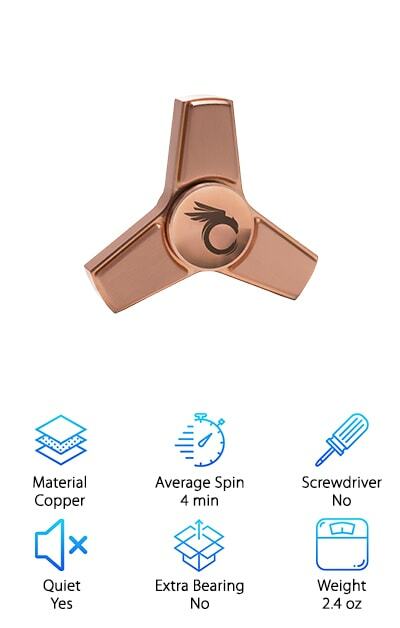 With a 100% copper body and ceramic, stainless-steel hybrid bearings, the spinner feels good in your hands and achieves awesome motion and gravity. The fast rotation is perfect for fidgety folks who want to spin for hours. Small, discreet, and easy to carry with you wherever you go, this toy is a nice way to relieve anxiety or replace another habit you want to break. Those who travel into deep thought and like to keep their hands busy will also get a kick out of the speed and fluidity of this spinner. Fun and relaxing, the TYZEST is a high-quality three-sided spinner that delivers everything you need at an affordable price. If you want to achieve top speed, you found it. This gorgeous rainbow-colored spinner makes our list as the top pick for the best cheap fidget spinner. Made from stainless steel and featuring laser industrial molding technology, you can be sure you’re getting a quality piece that will last and deliver the results you’re looking for. It comes with a complimentary screwdriver and extra bearing, just in case you need them. Spinning for an average of 3-5 minutes, ATESSON features fast rotation with quiet operation. If you’re looking for a spinner for work or school, this discreet model is perfect. It won’t disturb the people around you, except for the bright, attractive design being the envy of every other fidget-lover. The small, compact style means it fits easily into your pockets, so you can bring it with you wherever you go. If you’re on a budget, but you want a nice spinner that doesn’t compromise all the bells and whistles you love, ATESSON is the perfect pick for you. 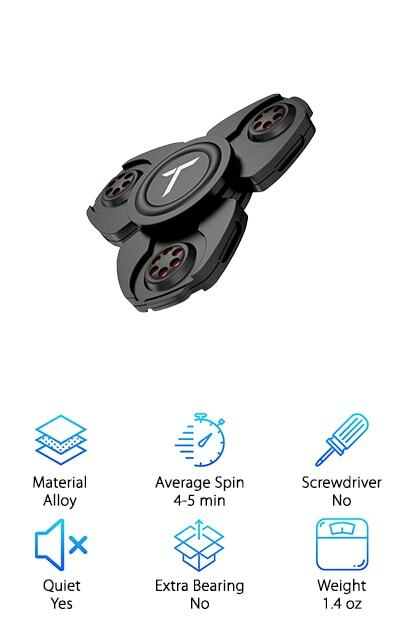 The Trianium Fidget Spinner brings to mind the best deep space science fiction movies with its industrial-looking design, sleek black and red coloring, and ultra-strong composition. Made from a metal-alloy blend that is shock-proof, this spinner is designed not to break, even under pressure. The high-performance chrome-ceramic ball bearing cuts down on friction to produce maximum speeds during use. Trianium is quiet and discreet, so you can be sure you’re the only one focused on spinning when you’re out in public. The three-sided design is small enough to fit in your pocket at about 3” across each way, so you can bring it with you wherever you go. This spinner has been specifically balanced and weighted for a perfect, smooth rotation. If you’re looking for a serious spinner, Trianium does not disappoint. Even better, it can be yours for a reasonable price. Look no further if you love the look and feel of alloy and smooth-cut edges. A truly deluxe model, the Infinity Silver Fidget Spinner is light, weighing in at not even a full ounce, and easily spins for five minutes. Made from brass, this smooth and sleek device features three sides with pure R188 bearings for a perfect rotation. When you use the Infinity, you enjoy balanced spinning with little effort. The simple look and feel are designed to boost concentration and soothe anxiety and hyperactivity. Even better, it features a quiet spin that is perfect for work or class. Infinity is also easy to clean and highly durable. As a bonus feature, the Infinity comes with its own care guide and trick guide! If you’re looking to learn tricks to pass the time or impress others, you won’t want to miss out on the Infinity. The lightweight and efficient design make it easy to maneuver and the trick guide gives you plenty of options and ideas with instructions. Get this premium spinner today and start enjoying all the perks. It’s worth the investment. Fans of rose gold rejoice! You can now match your spinner to your electronics. The Phoenix comes in beautiful rose gold and features an interesting phoenix bird logo in the center. 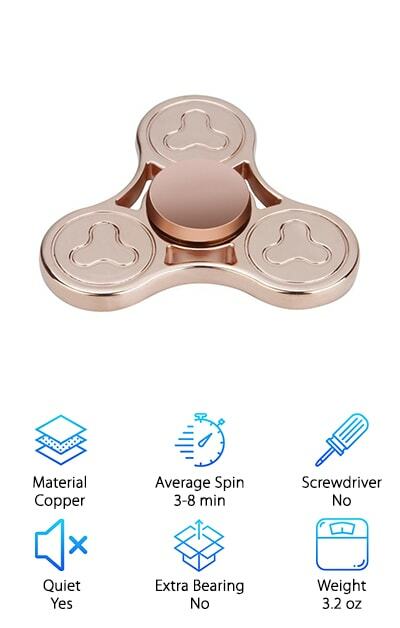 Made from durable copper, it adheres to the tri-spinner design with three weighted sides. Equipped with PowerSpin technology, Phoenix guarantees that its spinner will go for four minutes at maximum speed. Enjoy smooth and effortless spinning in style with this top-notch model. The sleek appearance looks professional and classy. Its ultra-quiet rotation makes it a great choice for anyone who wants to spin in public places, including classrooms and work. And get this: this gorgeous spinner comes complete in a designer gift box, making it a lovely present or a great option if you like the idea of ideal storage for your spinner. Best of all, you receive a five-year warranty with your purchase, so you can rest easy knowing you’ll be spinning for a long time. Looking for spinners in bulk? Whether you like to have back-ups and options for yourself or you plan on gifting the other spinners, the 7 Pack gives you seven different awesome rainbow-colored choices that will keep you spinning for as long as you like. Complete with spinners of all shapes, the 7 Pack features five three-sided spinners, a seven-sided spinner, and a four-sided spinner. Each model is made of stainless steel and equipped with solid R188 high-speed bearings in the center to ensure smooth rotation and maximum speed. Reach up to 3-5 minutes of continuous spinning with minimal effort. These perfectly weighted spinners make tricks easy. While researching and reviewing the best metal fidget spinners, our experts uncovered a pack of them for the price of one! You won’t want to miss this awesome deal, especially if you spend a lot of time spinning or you want to be generous with your friends. It wouldn’t be a stretch to say the MTELE is one of the coolest-looking fidget spinners around. It’s designed to resemble a black Chinese dragon and features a circular construction instead of sides, making it a unique option perfect for anyone who likes to be different. This weighted circular model has a premium bearing and can reach up to five minutes of continuous spinning. Constructed from durable alloy, the MTELE is extra small, making it a great companion for you everywhere you go. It spins quietly, so you don’t have to worry about causing a commotion while using it in public. In fact, this tiny dragon is the ideal design for use in sensitive settings, thanks to its compact and silent rotations. Whenever you’re feeling overwhelmed or you have energy to burn, MTELE has your back. If you’re looking for a small, unique spinner, or you love dragons, the MTELE is the perfect spinner for you! If you’re searching for the best fidget toys for adults, look no further. Enow is a six-sided weighted spinner that delivers maximum speed rotations to help you calm down, reduce stress and anxiety, and burn off excess energy. When you need to focus or enhance your thought process, you can rely on Enow to help you redirect your mental energy to where it belongs. Made from pure aluminum with a ceramic bearing, this premium spinner reaches a speed of up to five minutes of uninterrupted spinning. Best of all, we think the Enow is ideal for adults because it delivers a completely silent spin. You can use it discreetly in public without drawing attention to yourself. Resembling a six-pointed snowflake in silver and blue, the Enow looks professional and clean and is appealing to the eye. Conquer your anxiety, stress, and energy in style! With rave reviews and available at an affordable price, the Enow is sure to keep you busy and happy. The Zip spinner looks smart in black with multi-colored bands around the ends of its six sides. It promises a lightening speed rotation for up to six minutes, which is one of the fastest designs we’ve seen on the market! Made from aluminum and with premium fidget spinner ball bearings, the Zip lets you switch from trick to trick without a long lag time in between. Its design provides for easy one-handed spinning, flexibility, and twisting. Watch the spinner disappear and the colors swirl as your Zip reaches maximum spinning speed. Almost like an optical illusion, this spinner makes keeping your hands busy fun and attractive! Small and quiet, the Zip is appropriate for all settings and occasions. 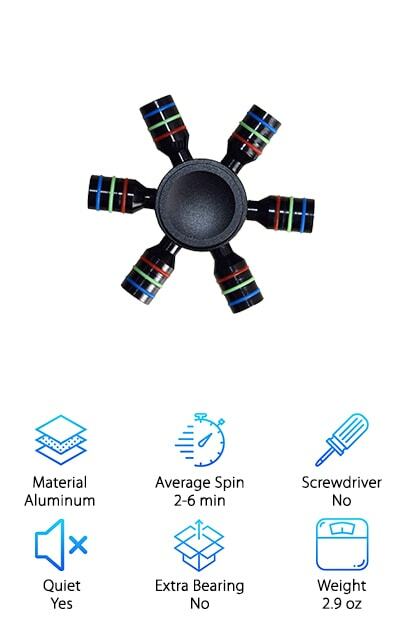 If you’re looking for a fun toy for tricks or you need a spinner to help reduce anxiety and focus your thoughts, this model has you covered. Affordable, durable, and cool to watch, you don’t want to miss out on Zip. 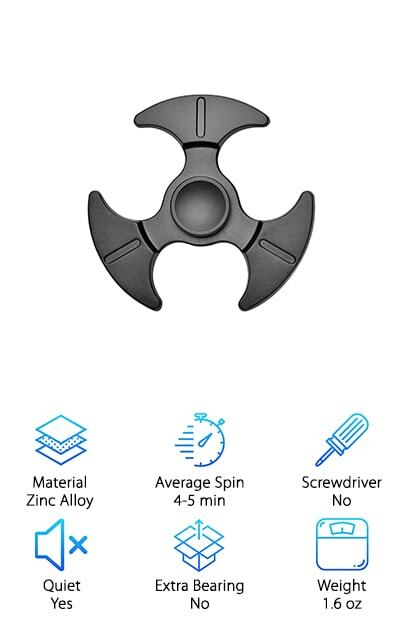 The OUUO spinner is an all-metal model that feels great in your hands and has a durable construction that keeps it looking new and working well. It is made from zinc alloy and stainless steel bearings that can reach a continuous spin of up to five minutes! Concave finger grips help you achieve maximum rotating speed and perform all of your favorite tricks. The perfect activity if you want to replace a bad habit, reduce stress, or redirect your wandering attention, the OUUO spinner feels great in your hand. The smooth, brushed black finish looks perfect on this tri-spinner’s three flared sides. If you like to spin in style and comfort and you need an option that won’t break under pressure, the OUUO is for you. Don’t pass up on this beautiful all-metal model that’s available to you at a great price! Happy spinning!